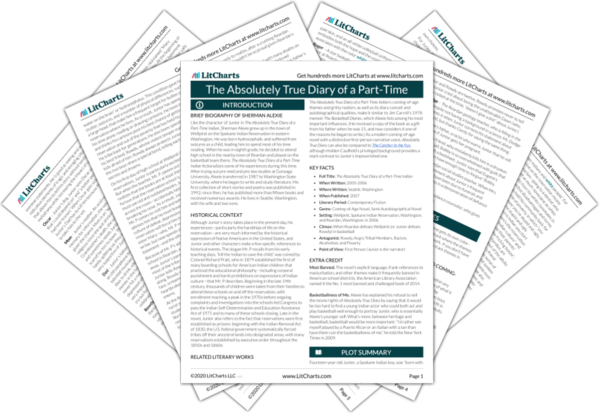 Instant downloads of all 942 LitChart PDFs (including The Absolutely True Diary of a Part-Time Indian). LitCharts assigns a color and icon to each theme in The Absolutely True Diary of a Part-Time Indian, which you can use to track the themes throughout the work. It’s true to Grandmother’s spirit of forgiveness that the Indians choose to forgive Junior—at least temporarily—during her wake. Junior once again declares that his friendship with Rowdy transcends their fight. In the same way, his tribe will always be his tribe no matter how much it rejects him, and his grandmother will always be his grandmother even after her death. So many people have come to the funeral to tell stories and say goodbye that the coffin has to be moved onto the football field—a “crazy and fun and sad” send-off that Junior knows Grandmother would have loved. As the mix of sadness and fun at Grandmother’s funeral shows, things never have just one meaning. Junior is especially adept at recognizing the emotional complexity of different situations—things are hardly ever just sad, but often have a funny side too. One of the guests is a white billionaire named Ted, whom the Indians recognize as being “famous for being filthy rich and really weird.” To everyone’s exasperation, Ted begins his story by saying how much he loves Indians and their culture. He goes on to tell the story of buying what he knew was a stolen powwow outfit and feeling guilty for years about keeping it. While Junior wonders why Ted has chosen his grandmother’s funeral for this confession, Ted explains that he learned from an anthropologist that the outfit was Spokane and belonged to a woman named Grandmother Spirit. Ted has now arrived to return the powwow outfit to her children. Ted’s patronizing “love” for Indian culture is very different from Grandmother’s open-hearted love for everyone she meets, or from Junior’s love for his white friends. Rather than accepting people for whoever they might be, Ted loves a generalized, reductive idea of what he thinks Indians are like, as illustrated by his ignorance about powwow outfit. The fact that he co-opts a funeral for his confession doesn’t help his case. He seems to want public recognition more than he wants any kind of absolution. Junior’s mother rises to accept Ted’s apology and explains that there’s nothing to forgive: her mother wasn’t a powwow dancer, and the outfit is clearly not of Spokane design. As a humiliated Ted packs up and hurries away, first Junior’s mother and then all two thousand of the funeral guests begin to laugh. Though Ted’s attempt at confession fails when Junior’s mom exposes his ignorance, the crowd at the funeral experiences a catharsis similar to forgiveness through their laughter, finding joy and humor in spite of their loss. 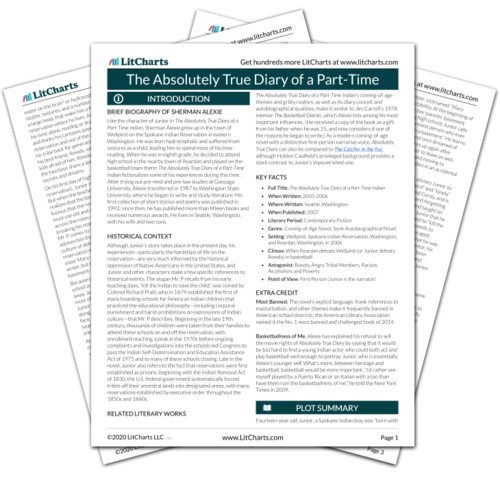 Get the entire Diary of a Part-Time Indian LitChart as a printable PDF. Closing the chapter with “our lonely, lonely houses,” Junior raises the important point that people can be isolated even when they are part of a community—in fact, individual loneliness can be the defining feature of a group. Since loss—of land, language, culture, and loved ones—is for Junior one of the defining features of being Indian, it makes sense that he feels most connected to his tribe at a time like this. Smith, Rosa. "The Absolutely True Diary of a Part-Time Indian Chapter 23 – Wake." LitCharts. LitCharts LLC, 18 Sep 2015. Web. 18 Apr 2019. Smith, Rosa. "The Absolutely True Diary of a Part-Time Indian Chapter 23 – Wake." LitCharts LLC, September 18, 2015. Retrieved April 18, 2019. https://www.litcharts.com/lit/the-absolutely-true-diary-of-a-part-time-indian/chapter-23-wake.